We quit reasonably well paid jobs in London to go on an around the world 'uber-honeymoon' from October 06 to July 07. Trip includes: India, S.E. Asia, Australia, NZ, and S. America. These are postings from our trip. First thing tomorrow we head off to Buenos Aires airport to fly home, so this may be the very final posting of Joe and Laura's Big Trip. The trip has been a wonderful experience and, though we're looking forward to seeing friends and family, after so much time in so many fascinating and beautiful places, it'll doubtless be tricky to go back to life in busy, polluted, stressful London. Yet through that, we must remember that London, for all its downsides, is one of the world's greatest cities. Compared to the vast majority of the world we've seen, it is a city of incredible wealth, incredible choice, and incredible opportunity. We must count ourselves lucky. To finish the blog we wanted to post a brief note of thanks to everyone who's been reading it, e-mailing us with comments or otherwise supporting us along the way. Throughout the trip it has made a real difference to us to know that people back home have been following our travels and thinking about us. Simply: many thanks to all. One of the many remarkable things about Laura through the trip has been the incredible number of hats (and other headwear pieces) she's got through. 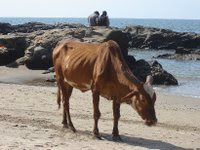 Cows roam the streets, highways, towns, beaches, parks and train platforms everywhere you go in India - they are one of the striking images and memories. The Indian caste system remains a major factor behind huge social divides. The upper castes invariably receive a top-level education second to none, and the lower castes often no formal education at all. I felt like an idiot as I was pick-pocketed twice in the space of 24-hours at a festival in Pushkar, Rajasthan (fortunately I didn't lose much - either time). India has a fantastic rail network, but trying to reserve a ticket is an incredible journey through a complex maze of catch22 bureaucratic hoops. After terrific cakes in India, we noticed a rather disappointing lack of dessert on the menus of S.E: Asia. Whether it be the Mekong River, the Mekong Delta or the Kok River in Bangkok - waterways are a major means of public transport in S.E. Asia. Perhaps there's a lesson for London? Sticky rice is eaten with absolutely every meal in Laos - they love it; Laura liked it; I absolutely hated it. Mopeds are everywhere in S.E. Asia, but the remarkable thing is the age of the kids who drive them in Laos or Cambodia - we regularly saw kids as young as 6 or 7 whizzing around town. S.E. Asian ladies like to keep their faces pale and untanned - they love their parasols (they even drive mopeds with them) and whitening cream is a widely available beauty product. Cambodia's genocidal and war-torn history is clear in its population stats, which show over 50% of the population is under 15. There's also a very high female to male ratio. We were hugely impressed with Sydney and Melbourne, but provincial urban Australia is a different matter - we didn't have enough time to get to know it, but it sure looks and feels like Redneck Street, Hicksville, Chav County. Went on a 2-day drive along the scenic Great Ocean Road, west of Melbourne. An impressive construction, blasted out of the cliffs but leading to nowhere much, it was built to provide work for 1st World War veterans in the early 1920's. We spent happy hours flying a stunt kite we bought in Christchurch on New Zealand's many spectacular (and windy) beaches. However, the kite was was pretty quick and, unfortunately, I kept wiping out seagulls. We were pleasantly surprised at New Zealand's only major city. It has plenty of restaurants, shops and bars, an impressive business centre, nice docklands and is set stunningly on an incredibly thin strip of land between huge oceans to the East and West. There are masses of dogs (domesticated, wild, cute, intimidating) in every town we visited in Chile and Argentina. Like or loathe them, there is barking through the night and dog-poo on the streets (masses of it). Lots of nice red wines in Argentina mostly produced around the city of Mendoza in the West. We sampled most of them (several times each). They just don't get it. They don't think of chicken as a 'meat' and regularly put ham in 'vegetarian' salads. Poor veggie Laura has been flummoxed several times. There are masses and masses of old cars in South America. They are often 'souped up' with raised rear axels, flashy paint jobs and loud engines. Brazil is quite progressive in 'green' energy sources. Hydro-electric power produces a large part of its electricity, and many Brazilian cars have been converted to run on alcohol from sugar cane as well as petrol. … is fabulous, and has a unique character. The beaches we saw were beautiful and the beach bars and resorts around them very lively (even though it wasn't great weather or high season). Bolivia's capital is an amazing city. It stands 4000 metres high in the Andes with buildings sprawling up the sides of the enormous 'bowl' in which it lies. 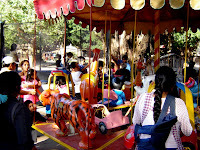 It's population is predominantly indigenous with its own unique culture and it is full of fascinating street markets. Some two months since we were last here (and four months since we arrived in South America), we find ourselves back in Buenos Aires in good time to catch our flight home on Friday. The end of our trip has coincided with remarkably cold weather: this week saw the first snow in Buenos Aires since 1918. In 4 months we've visited just 5 countries (and one of them for one night only) and have found South America spectacular. From the Patagonian wilderness in the deep south, to the warm Brazilian beaches and the high Andes of Bolivia, we've found incredible diversity. We've also found a wealth of culture, with each nation distinct and populated with its own unique mix of people. In summary, our favourite country was Brazil, our favourite cities were Salvador (Brazil) and La Paz (Bolivia) and our favourite region was Patagonia. 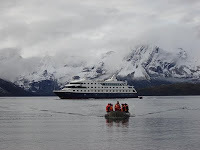 We took a wonderful all-inclusive 4-night luxury cruise around Cape Horn, which took us seal and dolphin watching through the incredible glacier wilderness of Chile's deep south fjordlands. And to top it all we got the whole trip as a late booking end of season bargain at less than one-third the usual price. We were in the right place at the right time for an incredible show of autumn colours in the Argentinean Lake District. 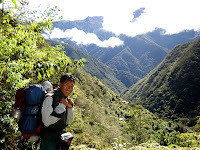 Particularly memorable was a 7-hour return walk up a forested valley-side from the town of El Bolson. The red-brown panorama from the top - under clear skies - was one of the greatest sights of the whole trip. Comprising 275 separate waterfalls of up to 74 metres high, along a width of nearly three kilometres, the mighty Iguaçu falls are one of the natural wonders of the world and a South American 'must see'. 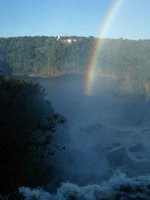 We had fun snapping pictures of the rainbows which hang constantly in the mist. 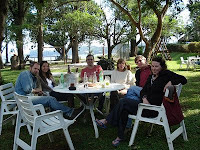 We were treated to a long weekend of generous family hospitality by Laura's uncle Richard and family in Sao Paulo, Brazil. We were given a very informative tour of the city, fed at some of the finest 'all you can eat' restaurants in Brazil, and treated, spoiled and pampered lavishly at every opportunity. We spent chilled-out times quietly enjoying the unique character and architecture of some of the surprising old Portuguese colonial towns Brazil has to offer. 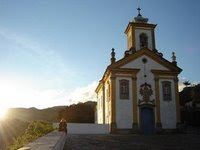 We particularly liked the old port town (now beach resort) of Paraty and the former regional capital/ mining centre of Ouro Preto, high in the hills inland from Rio. We went 1000km beyond our planned route to visit the city of Salvador, halfway up the Brazilian coast - and it didn't disappoint. We loved the character of the old colonial city centre, the warmth of the people, and the sheer volume of the open-to-all street party that takes place every Tuesday night. Amazing sunsets and clear stars alone make a trip to the Pantanal - the vast wetland wilderness in Brazil - a worthwhile excursion. 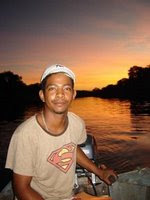 But we also saw impressive wildlife and have a tale to tell of being chased back from a fishing trip through piranha-infested waters by an angry gang of giant otters. 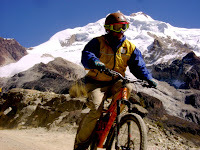 The Bolivian Andes offer some of the best mountain biking in the world. 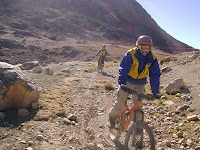 We went on two awesome downhill rides, both of which took us on descents of over 3000 meters. 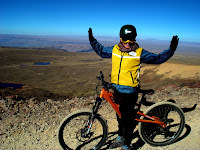 They were amazing experiences for the ´roof of the world` views at the top, as well as the speed, exhilaration and adrenaline-buzz of the descents. 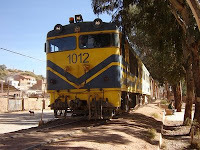 Unusually for South America, Bolivia offers several opportunities for rail travel and we enjoyed three great journeys. They were a chance to see a slice of 'real' provincial Bolivian life, to pass through stunning desert scenery and to enjoy the charming old-style touches to Bolivian rail travel (such as buffet cars with wine lists and uniformed waiters). Following my previous blog on the Copa America, this is an update to say that it was the Brazil - Argentina final we were all hoping for. And the result? ... a very pleasing Brazil 3 - Argentina 0 thrashing (though we had to sit through it pretending to be glum, given we were watching it in a Buenos Aires bar). Argentina is not my favourite South American country, but it does offer tremendous value for money. Returning here from Bolivia we were immediately treated to the finest first-world standards of accommodation, transport, food, drink and services, but at about a third the price you would expect to pay in Europe. But it's not always been like this. In fact only a few years ago the country was virtually off-limits for all but the wealthiest travellers. From 1991 - 2001, the Argentinean Peso was held artificially by the Government on an exchange rate of 1:1 against the US Dollar, through something called the 'Convertibility Law'. However in January 2002 the 1:1 exchange rate could no longer be held, the Convertibility Law broke down, and by the start of February the value of the Peso had collapsed to a rate of 3:1 dollars, where it has remained - more or less - ever since. Argentinean people are proud, and the crash must have hurt deeply. It would be difficult to overstate the impact it would have to see the value of your personal wealth crash to a third of what it was, overnight - through absolutely no fault of your own. It must have hurt all the more to see, at the same time, Argentina's national status tumble from being one of the wealthiest countries in South America - comparable with western European countries - to being one of the cheapest. 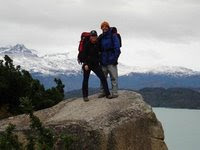 Still, just over 5 years on, it's all been good news for us travellers - and with the Pound currently so strong against the Dollar in its own right, Argentina is certainly a very good place for us to be spending money right now. We've been lucky to be in South America for the 2007 Copa America, the international soccer tournament equivalent to the Euro Championships. South Americans are indeed as passionate about footy and as fiercely nationalistic as stereotypes would have it, and the games have been on televisions everywhere we've been for the past few weeks. It's been great fun, not least because 4 months in S. America has given us time to develop a few prejudices of our own for or against certain countries, and so the teams involved. Begun in 1916, which makes it the oldest national teams tournament in the world, the Copa is held every two years. Current champions are Brazil, and this year's hosts are Venezuela. The tournament always comprises the 10 South American countries (for info: Guyana, Suriname and French Guyana may be geographically in S. America but are classified as Caribbean States) plus two invitees - this year, Mexico and USA. It's currently semi-finals stage. Argentina will play Mexico and Brazil will play Uruguay. The initial group stage saw elimination of Bolivia, Ecuador, Colombia and - to everyone's delight here in South America - the USA. The quarter finals, which were completed yesterday, saw elimination of Paraguay, Chile, Peru and hosts Venezuela. The remarkable thing about the quarter finals was that all 4 games were complete walkovers (Uruguay 4 - Venezuela 1; Brazil 6 - Chile 1; Mexico 6 -Paraguay 0; Argentina 4 - Peru 0). So who's going to win it? Well, so far Argentina have looked the strongest in terms of consistency and have played some fantastic football. (Unfortunately, old habits die hard and I simply find myself unable to support them on the footy field, even though they have played some great football and - get this - not generally been cheating, diving or cropping). Brazil (who I am supporting) have been occasionally brilliant/ occasionally average, but have an 'ace' up their sleeve - the undoubted star player of the tournament: striker/ right winger Robinho. Mexico surprised everyone by beating Brazil 2-0 in their opening game, have continued to play well, and could yet be the surprise package. Meanwhile Uruguay, who hold the record jointly with Argentina for winning the Copa the most times (14), have been improving as the tournament has progressed with ex-Man U striker, Diego Forlan, looking good up front. The semis are on 10th and 11th July, with the final on the 15th, by which time we'll be in Buenos Aires. Personally I'm hoping it'll be the Argentina - Brazil final that most people are expecting. If it is, then although an Argentina win would doubtless ensure a great party in the final week of our trip, I'll be wearing my bright yellow Brazil t-shirt (carefully hidden under a thick jumper, of course). 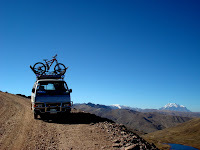 Rather like India, Bolivia has a certain ´double-take´ quality, in that you regularly see sights which make you look again, raise an eyebrow and shake your head in disbelief. That, coupled with the fantastic light and blue skies 4000m up on the Altoplano, make it a terrific country for a spot of photogrophy. Landlocked Bolivia is one of the poorest countries in South America and has one of the most turbulent political histories. It is also a country of huge extremes in terms of landscape and climate , which has made it a fascinating, and sometimes slightly difficult place to travel through. It is a moderately small country by South American standards and has a population of about 9 million, two thirds indian (see Inca/ indian flag - top) and the other third mestizo (mixed European and indian origin). Bolivia also boasts the highest capital in the world, La Paz, at 3,600m which is an incredible city, perched precariously on steep hills. 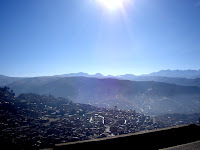 The majority of the population lives on the Altiplano, at an average of about 3,500m above sea level. The rest live in the warmer and richer low-lying Oriente, which takes up two-thirds of the country. 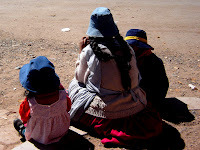 Spanish, Aymara and Quechua (the inca language) are all official languages and taught in schools. 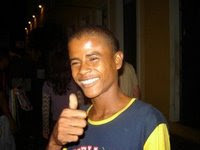 Many of the rural population do not speak Spanish. 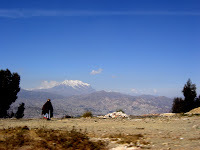 The indian population, living mostly in the Altiplano, were slaves to the Europeans during colonisation and the wealth divide that was created at that time remains today. You see women in traditional dress everywhere you go, with rucked skirts of bright colours and bowler hats. Bolivia has suffered in all its battles with neighbouring countries in South America, losing large chunks of land to Paraguay, Brazil and most importantly to Chile, when it lost its access to the sea in the War of the Pacific at the end of the 19th century. There has been much political instability in Bolivia's recent history, with numerous military coups and ongoing civil unrest. Efforts by different governments to eradicate coca production (the raw material used to make cocaine) have also lead to widespread poverty in rural areas. 3) legalise coca production (coca is considered to have huge cultural significance in Bolivia). The last initiative, as well as Bolivia's strengthening ties with Hugo Chávez, the leader of Venezuala and its proposals to limit investment from foreign companies, have strained relations with the US and other foreign parties in the past couple of years. Our stay in Bolivia has been fascinating - the strong influence of indian culture, the ongoing political struggles and the huge extremes not only in climate and altitude but also in wealth and culture provide endless food for thought. 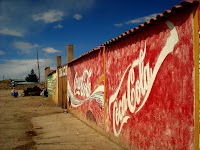 Whatever you think of big international corporates and the ethics of their marketing, you cannot help but be struck by the characterful Coca-Cola ads you see hand-painted on walls in dusty small towns all around provincial Bolivia.